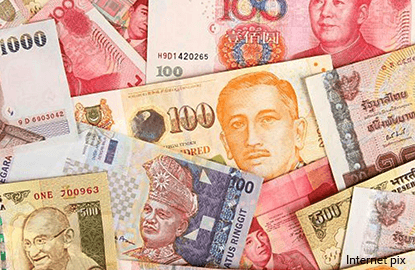 SINGAPORE (Feb 21): Most emerging Asian currencies eased against a broadly firmer US dollar on Tuesday, with the Philippine peso plumbing 10-year lows having breached a key support level of 50 per US dollar. The Philippine peso slipped to 50.355 per US dollar at one point on Tuesday, its weakest level since September 2006. The peso has underperformed against emerging Asian currencies so far this year with a drop of 1.2%. "The Philippine peso is weak because of a host of domestic reasons. These include strong imports resulting in further widening of trade deficit, ongoing equity liquidation by foreign investors," said Heng Koon How, senior FX investment strategist at Credit Suisse in Singapore. The drop in the peso gained momentum after it slipped beyond the 50.00 per USdollar threshold on Monday, breaching a support level that had held since late November. Some market participants say the peso's drop this week was probably partly the result of an apparent softening in the central bank's efforts to curb the peso's weakness. "Previously, the 50 level had seemed to be a line that was being defended," said Hirofumi Suzuki, an economist for Sumitomo Mitsui Banking Corporation in Singapore. "But it seems as if that (stance) is being gradually softened," Suzuki said. The head of the Philippines central bank said on Tuesday that market positioning and demand were among the factors behind the peso's movement, adding these were part of a "healthy vibrant market". "This is not to say we will stand back when we see that movements are disruptive or excessive," central bank governor Amando Tetangco said in a mobile text message. The peso's drop came on a day when several other Asian currencies slipped against a US dollar that was underpinned by a rise in US Treasury yields. The Singapore dollar and the Indonesian rupiah slipped 0.2%, while the Chinese yuan eased 0.1%.